In many cases, organisations also use process maps to facilitate their move from a wordy paper-based business management system to a smarter mobile solution. These three areas are all very necessary to help you to capture accurate and complete process data and create an effective process map from start to finish. For this checklist to be the most effective possible, you'll need to download it, print it off and tick the boxes as you complete each exercise. I encourage you to by clicking on the link. Need Help With The Checklist? This checklist was created as a companion piece to your process mapping project, so if you don't know what process mapping is or have trouble understanding all the steps laid out in the checklist, you'll first have to get more familiar with the idea of process mapping. the To-Be maps determine the desired future state of where you want your business processes to be after the continuous improvement project. To the uninitiated, process mapping can be tricky to understand and even harder to get right on the first try. Understanding how to capture data consistently is a tricky process which is why I have included information on the Noun-Verb method of process mapping and information that will clarify the meaning of the symbols used to capture the key process data below. This does not mean that you cannot insert your own methodology or use other process mapping tools or symbols, it is simply the best way to represent process mapping in its purest form. Triaster uses the Noun-Verb Method of process mapping. It is a powerful and simple method that has delivered process diagrams that are useful to hundreds of organisations, and at the same time to business analysts. 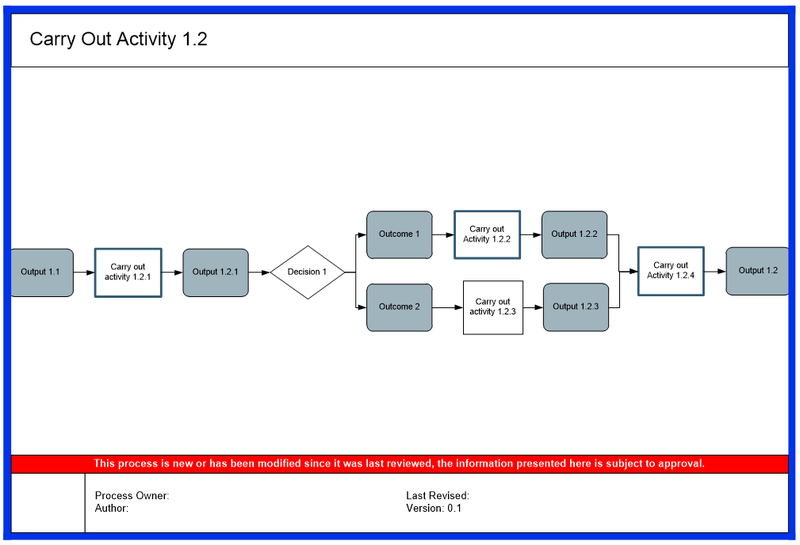 A process map drawn using Noun-Verb is a diagram that clearly identifies the main steps involved in performing the process and the items used and produced when the process is complete. In our process capture method, the term Activity is used to describe something you do, and the term Deliverable is used to describe something you produce. Activities are the steps of the process and are described using verbs, Deliverables are the items produced (or ‘delivered’) when each step of the process is complete and are described using nouns. The diagram below shows part of a map of a recruitment process. In this diagram, the Activities (inputs) are ‘Define job role’ and ‘Obtain sign off’. The other symbols are the Deliverables (outputs). Each Deliverable is described using a noun; each Activity is described using a verb. A recommendation rather than a rule is that in the process map itself, no two verbs can be directly connected, and no two nouns can be directly connected. This recommendation can be strongly or weakly enforced depending on the nature of the content being produced and the level of detail. 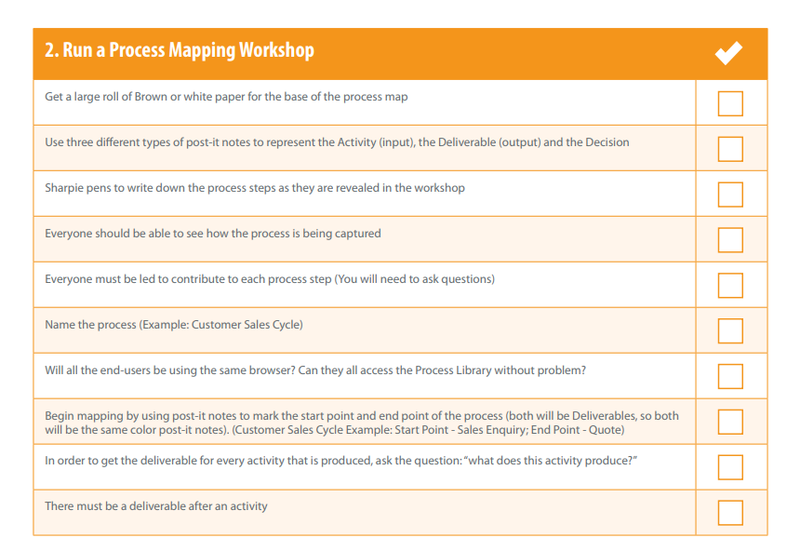 The symbols/shapes used in a process map highlight how the process mapping picture connects. Every step in a process map is represented by using different symbols that assign a specific, consistent meaning to every step in the sequence. This means that just by looking at a symbol, you can identify if something is an input, output or a decision. Of course, there are many other symbols you can use to assign to your own process maps - as needed per the level of complexity - however inputs, outputs and decisions represent process mapping in its simplest form. Without a standard template of symbols, process maps can become difficult to interpret and lack uniformity across your business processes. If you're not sure which shapes/symbols you are going to need for process mapping, make sure you download our simple guide explaining the most common symbols used in process mapping. 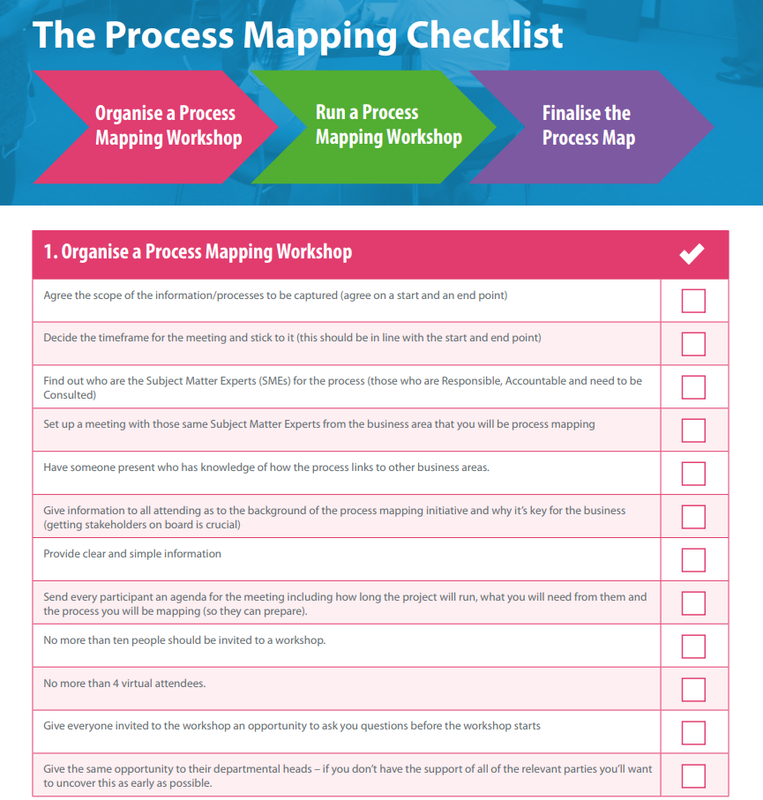 Now all you need to do is actually plan and organise your process mapping workshop. A massive tip I'll leave you with, so that you can easily identify the process stakeholders for each process you will map, is to create a full RACI Matrix. a RACI Matrix will Identify all the key process mapping stakeholders (people who are responsible for the process, accountable for the process and consulted on a process). Using a RACI Matrix is a great way of getting simple visual representation of exactly who should be in a room discussing any change with a specific process (this should be the RAC part of the RACI – Responsible, Accountable and Consulted). This should be enough information to help you create an accurate process map from start to finish, but just in case it isn't, fill out this quick survey with your unique process mapping problem and I'll get back to you with an answer as soon as possible. I hope this checklist proves helpful and if you have any suggestions for improvements to the checklist, I would love to hear them in the comments section at the bottom.